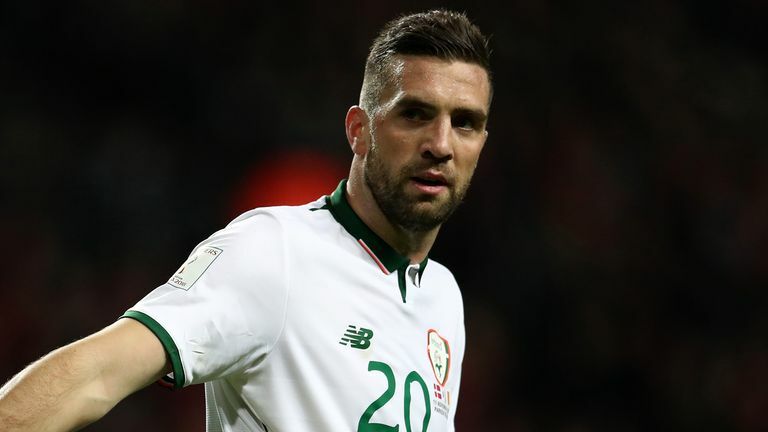 Shane Duffy has described the Republic of Ireland's 4-1 thrashing at the hands of Wales in Cardiff last month as "one of the low nights" in his career. The two sides play in Dublin in the Nations League on Tuesday - live on Sky Sports - with Ireland seeking to avenge their defeat in Cardiff. Duffy played the entire match against Wales, and admits he came off the pitch feeling as though he had let down the country's fans. He told Sky Sports News: "(It was) one of the low nights in your career where you do get embarrassed on the pitch a little bit. Everything went wrong on the night. "From the off, the ball came back to me and Gareth Bale chased me down and blocked it and they got a throw-in in our half. That sort of set the tempo that night. "We came off the pitch a little bit embarrassed. We let our fans down, which is obviously the biggest thing. As an Irishman, you don't want to let them down, and we did. "We're trying to put it right. That's the aim, and hopefully we can forget about that night." Ireland are currently bottom of their Nations League group, and need to either beat Wales on Tuesday or Denmark in Aarhus next month to stand a chance of avoiding relegation.